U.S. Army Marksmanship Unit rifle shooter to join fellow Soldiers at London Olympics. FORT BENNING, Ga. — Staff Sgt. 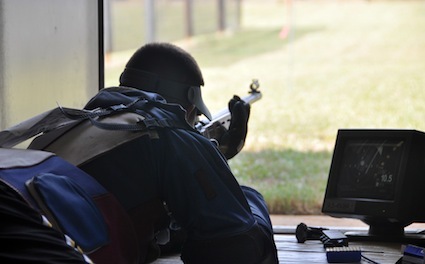 Michael McPhail, U.S. Army Marksmanship Unit, shoots during the final June 5 at Pool Range Complex. McPhail won the U.S. Olympic Team Trials Rifle Prone match, earning his first berth to the Olympics and is the sixth member of the USAMU who will shoot for gold in London later this summer. A Soldier from the U.S. Army Marksmanship Unit is joining some of his battle buddies in London this summer after winning the U.S. Olympic Team Trial match for Men’s Rifle Prone today at Pool Range Complex here. Staff Sgt. Michael McPhail qualified for his first Olympic games after a stellar three-day performance on his home range and will compete alongside a USAMU counterpart in hopes of bringing back a medal. Coming off a bronze medal-winning performance at the London World Cup, the stage was set for McPhail to continue his outstanding shooting and nail down an Olympic team berth. McPhail started the match off June 2 with a blistering 599 in the qualification round and followed it with a world-class score of 105.4 in the first day’s final, establishing himself as the man to beat from the very beginning. Matthew Emmons, the 2004 Olympic Gold Medalist in the event and world record holder, and Sgt. 1st Class Jason Parker, McPhail’s teammate and a three-time Olympian himself, came back on the second day and put pressure on McPhail, outshooting the Darlington, Wisc. native by a few points but not enough to put a significant dent in his lead. Parker said all signs pointed to this being McPhail’s time and even though he lost this chance at another Olympic spot, he was glad his USAMU teammate secured his first Olympic berth. FORT BENNING, Ga. — Staff Sgt. Michael McPhail (Left) and Sgt. 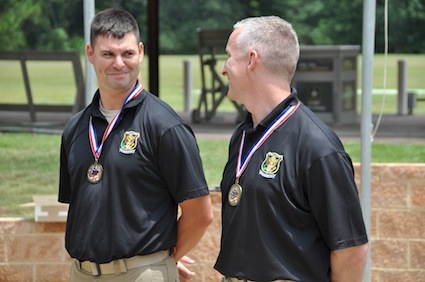 1st Class Eric Uptagrafft, U.S. Army Marksmanship Unit, share a laugh during the awards ceremony June 5 at Hook Range. McPhail won the U.S. Olympic Team Trials Rifle Prone match, earning his first berth to the Olympics. He will join Uptagrafft, who had qualified for the same event last year. McPhail and Uptagrafft will shot Aug. 3 for a gold medal. On the third day, McPhail slammed the door on anyone else contemplating making a serious run on his Olympic dream. Despite Emmons tying the national record with a perfect 600, McPhail posted a 598 then settled into the final knowing a solid score would secure his trip to England. A relieved and excited McPhail stood up off the mat after taking the final shot of the match and was immediately swarmed with congrats from fellow competitors, observers and several of his USAMU brethren, signaling to him that he had made the team. McPhail will compete against and alongside USAMU teammate Sgt. 1st Class Eric Uptagrafft. Uptagrafft, who qualified for the games in 2011 after earning enough points in World Cup competition, is thrilled to have his friend and teammate along for the wild ride that is the Olympics. McPhail is now the sixth Soldier from the unit who will shoot for gold in London. 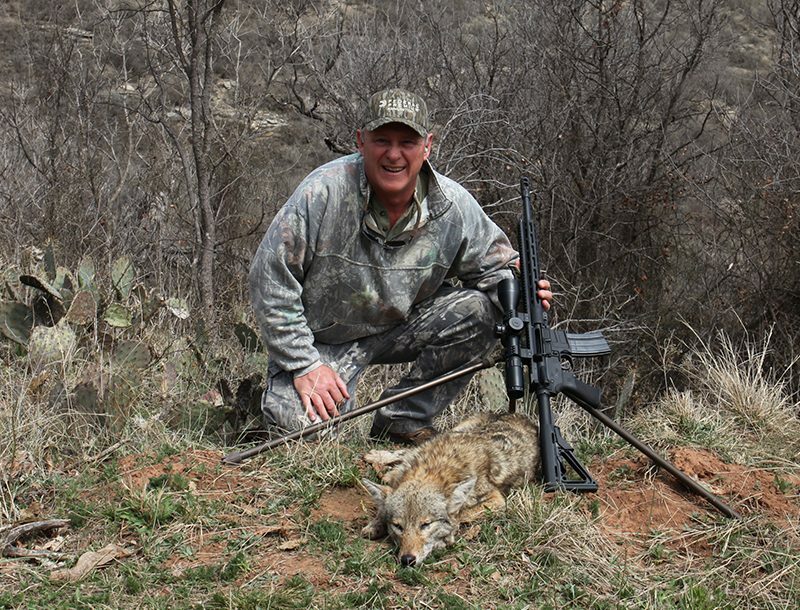 Besides himself and Uptagrafft, shotgun shooters Staff Sgt. Josh Richmond and Sgts. Glenn Eller and Vincent Hancock will represent the Army and U.S. at the Olympics. Sgt. 1st Class Josh Olson will compete in the Paralympics. The last slot on the Olympic Shooting team will be decided June 11 in Men’s Three-Position Rifle at Pool Range and USAMU Soldiers are considered to be favorites for the last spot. Source: Michael Molinaro for USAMU. 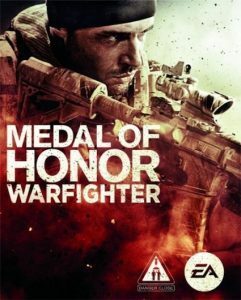 EA reveals pre-order bonus items for Medal of Honor Warfighter Limited Edition.